BDNF was the second neurotrophin to be discovered and has since been implicated as an important factor in neurogenesis and synaptic plasticity. Upregulation of BDNF in the hippocampus has been found to be more potent and sustained than that of other neurotrophins after several weeks of aerobic exercise. This evidence privileges BDNF in effectuating the benefits of voluntary physical activity in the brain. Furthermore, a strong correlation has been established between learning and BDNF gene expression—suggesting that activities which modulate BDNF, such as aerobic exercise, are beneficial to cognitive performance. BDNF promotes growth and survival of neurons throughout the Central Nervous System—particularly in hippocampal and cortical neurons—by allegedly strengthening excitatory synapses. However, recent evidence also suggests that it plays an important role in peripheral sensory neurons and skeletal muscle. Because of increasing evidence affirming its role in synaptic plasticity and neurogenesis, understanding the action of BDNF is vital to the creation of novel therapies for patients with neurodegenerative disorders. In such a way, it is perhaps possible to find a comprehensive link between exercise as a facilitator of physical health and mental health. BDNF mRNA is transcribed from the homonymous BDNF gene. The gene contains five exons associated with specific promotors that transcribe differentially throughout the anatomy. Glutaminergic receptors activated by excitatory synapses create an influx of Na+ and Ca2+ within BDNF-producing neurons. Subsequently, Ca2+ activates kinases which, in turn, activate transcription factors CREB and NF-kB for BDNF gene transcription. The resultant nRNA is distributed in vesicles throughout the cell body as well as dendrites which react to glutamate receptor activation. BDNF mRNA synthesizes a pre-proneurotrophin that undergoes cleavage into proBDNF. Further modification within the Golgi apparatus vesicles by prohormone convertase 1 produces the mature BDNF protein. The BDNF gene is found extensively throughout the Central Nervous System (CNS), where it is regulated by stimuli such as light and whisker movement. However, BDNF mRNA and protein concentration is particularly high within the hippocampus—acting in response to voluntary exercise. Superimposed BDNF Homodimers. 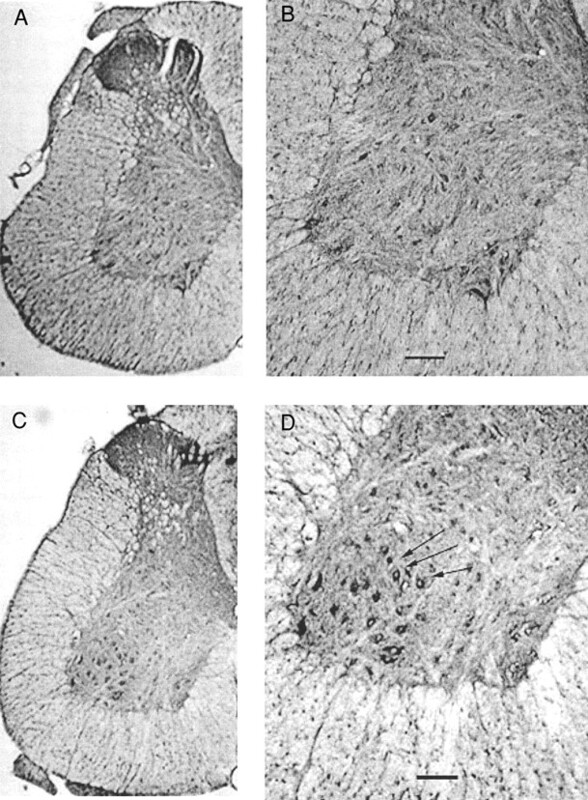 Source: Robinson et al., 1999. BDNF belongs to a family of growth factors identified as neurotrophins. Collectively, these four proteins share 50% of their amino acid structure. The neurotrophin protomers (i.e. proBDNF) each contain eight β-strands that twist into four antiparallel pairs—these get cleaved in half in the mature BDNF protein. A cysteine knot composed of three disulfide bonds tethers the common neurotrophin structure. Each homodimeric structure is differentiated through its individual loop regions where the amino acid sequences are dissimilar. These structural differences inform the neurotrophins’ binding profiles in relation to their specific tyrosine kinase receptor—BDNF acts on TrkB receptors. All four neurotrophins act on the p75 receptor. In a physiological environment, mature BDNF exists as a noncovalent homodimeric polypeptide with a 119-amino acid chain. Within the CNS, BDNF has been found to act within the hippocampus, cortex, lateral and third ventricles as well as the thalamus and hypothalamus. It should be reinforced, however, that exercise-dependent BDNF regulation is particularly strong throughout the mossy fibre axons of the granule cells in the hippocampal dentate gyrus. Much emphasis has been placed on the role of BDNF in mediating neuronal plasticity within the hippocampus. A large number of cholinergic and GABAergic afferents from the medial septum synapse on the hippocampus, providing a possible mechanism for exercise-dependent upregulation of BDNF therein. Though it has been determined that tonic regulation of baseline BDNF is done individually by both types of afferents, synergistic activity by GABAergic and cholinergic synapses has been implicated in regulating exercise-induced BDNF expression. This was determined through medial septal lesioning by selective immunotoxins, which revealed that BDNF upregulation still occurred after voluntary exercise when only the cholinergic pathway was disrupted. However, when both pathways were lesioned, both baseline and activity-dependent expression was attenuated. This research suggests that BDNF-regulating afferents act convergently in response to voluntary physical exercise. activation by BDNF. Source: Andero, Choi, Ressler 2014. Estrogen influences the effects of BDNF mRNA expression in female rats. In situations of estrogen-deprivation, exercise does not increase levels of BDNF in the hippocampus. Corticosteroids reduce BDNF bioavailability, while peripheral Insulin-like growth factor 1 favors increased BDNF gene expression through upstream signaling. Vesicles containing proBDNF and mature BDNF are trafficked to dendritic and axonal terminals and released depending on immediate neuronal activity. BDNF acts on the TrkB and p75 receptors. 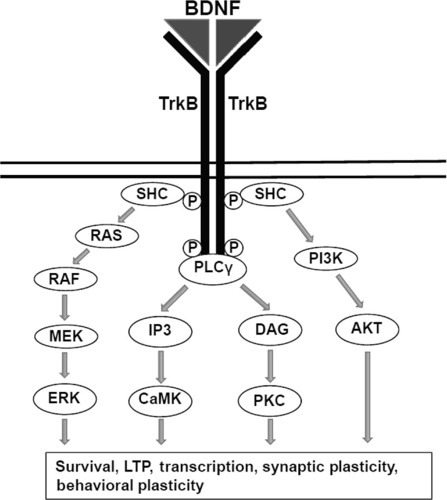 TrkB has a high affinity for BDNF, while p75 is affected by all members of the neurotrophin family. Thus, TrkB activation by BDNF has more conclusively been implicated in hippocampal-dependent learning. When BDNF binds to TrkB on the postsynaptic neuron, a downstream signaling cascade engages phospholipase Cγ, phosphatidylinositol-3 kinase and MAPK to actuate the transcription of proteins associated with neuronal survival, proliferation and axonal growth. TrkB expression in the rat forebrain has been associated with loci of cell proliferation, further suggesting that BDNF-TrkB interaction is critical for neurogenesis. The hippocampus is the site of long-term memory (LTM) consolidation and high plasticity—processes that are structurally and functionally regulated by BDNF. By inducing and sustaining long-term potentiation (which is integral to synaptic plasticity), BDNF is a potent factor in memory formation and cognition. Physical fitness has a mediatory role in promoting hippocampal growth of both white and grey matter and, consequently, hippocampal volume has a positive correlation with spacial memory. Empirical evidence suggests that BDNF levels in the hippocampus rise substantially after aerobic training. When serum levels of BDNF were examined in a group of exercising individuals as well as stretching controls after a six-month period, the exercise group had higher BDNF expression along with hippocampal profusion. stretching control (red). Source: Erickson et al., 2010. Furthermore, when subject to spatial memory tests, subjects who had trained for that period demonstrated greater accuracy and reduced response times when compared to the controls. Though some BDNF-associated volume gains were also found in the caudate nucleus and thalamus, they were not as significant as those in the hippocampus. This suggests that BDNF expression as a result of moderate voluntary exertion is conducive to hippocampal plasticity and neurogenesis. These findings were corroborated in a mouse model where the subjects were injected with bromodeoxyuridine (BrdU) to detect proliferating cells. The test group was given access to a running wheel for two to four months and subsequently trained on a Morris water maze. The BrdU markers revealed significant proliferation in the dentate gyrus of the hippocampus while latency and distance travelled to the platform were reduced in the running group. Because the hippocampus has been established as a locus of exercise-dependent BDNF expression, this evidence privileges the growth factor’s role in supporting cognitive function and neurogenesis. Though BDNF produces stark effects within the CNS (particularly in the hippocampus), some expression has been observed within peripheral areas as well. Contraction of skeletal muscle is voluntarily controlled and secretion of vascular proteins therein is activity-dependent. Recent evidence suggests that BDNF aids in the oxidation of adipose tissue in skeletal muscle as a result of voluntary physical exertion. In this context, BDNF acts as a myokine—ensuring the maintenance of muscle fibers. In another experiment, the inactivation of the soleus muscle with drugs resulted in decreased BDNF nRNA expression in the spinal cord—emphasizing the role of physical exertion in upregulating BDNF in the peripheral nervous system. The role of BDNF in autocrine processes has also been examined in the dorsal root ganglion. Findings indicate that, when exposed to antisense oligonuleotides affecting BDNF, survival of DRG neurons is reduced by more than a third. The study concludes that expression of BDNF in during the development of DRG neurons has an autocrine role in promoting survival. in trained rats (C and D). Source: Gómez-Pinilla et al., 2002. The consolidation of LTM is dependent upon the synthesis of new proteins that effectively increase neuronal volume within the hippocampus. Heterozygous BDNF knockout mice have been used to demonstrate the importance of BDNF in late-phase long-term potentiation in the hippocampus. Mice with induced LTM deficits due to anisomycin protein synthesis inhibitor showed increased latency at familiar objects during spontaneous place recognition tests. However, after exogenous BDNF was injected into the mouse hippocampus, the impairments were reversed. In a recent human trial, twenty-five elderly women (ages 65-75) with no known cognitive deficits were placed in an intervention group in which they participated in a multimodal training regimen twice a week. Twenty-four controls were also included in the experiment. The intervention group showed significantly higher peripheral blood concentrations of BDNF and much greater performance on cognitive tests than the control group. The study uniquely suggests that multimodal training regimens increase the associated cognitive benefits induced by BDNF more robustly than just aerobic exercise. Because the study participants were all older women, the results are indicative that exercise is important in stimulating neurogenesis as mediated by BDNF in elderly patients. BDNF has been shown to help overcome protein synthesis inhibition to ensure the persistence of LTM in the hippocampus after exercise, helping to prevent memory loss and mediating learning and cognitive development. Decreased levels of BDNF mRNA have been found in the hippocampus of Alzheimer's patients, the substantia nigra of Parkinson’s patients and the striatal neurons of Huntington’s patients. Thus, BDNF has potential for therapeutic properties via specific induction within the CNS. It has also been suggested that BDNF polymorphism may have a role in the development of post-traumatic stress syndrome, with less resilient individuals carrying less functional BDNF alleles. However, exercise-dependent BDNF expression has proven to mitigate many neurodegenerative effects. 1. Cotman CW, Berchtold NC. Exercise: a behavioural intervention to enhance brain health and plasticity. Trends Neurosci. 2002;25(6): 295-301. 2. Binder DK, Scharfman HE. Brain-derived neurotrophic factor. Growth Factors 2004;22(3): 123-31. 3. Marosi K, Mattson MP. BDNF mediates adaptive brain and body responses to energetic challenges. Trends Endocrinol Metab. 2014 Feb;25(2): 89-98. 4. Robinson RC, Radziejewski C, Spraggon G, Greenwald J, Kostura MR, Burtnick LD, Stuart DI, Choe S, Jones EY. The structures of the neurotrophin-4 homodimer and the brain-derived neurotrophic factor/neurotrophin-4 heterodimer reveal a common Trk-binding site. Protein Sci. 1999;8: 2589–2597. 5. Robinson RC, Radziejewski C, Stuart DI, Jones EY. Structure of brain-derived neurotrophic factor/neurotrophin-3 heterodimer. Biochemistry. 1995;34: 4139–4146. 6. Andero R, Choi DC, Ressler KJ. BDNF–TrkB Receptor Regulation of Distributed Adult Neural Plasticity, Memory Formation, and Psychiatric Disorders. Prog Mol Biol Transl Sci. 2014;122: 169-92. 7. Pencea V, Bingaman KD, Wiegand SJ, Luskin MB. Infusion of brain-derived neurotrophic factor into the lateral ventricle of the adult rat leads to new neurons in the parenchyma of the striatum, septum, thalamus, and hypothalamus. J Neurosci. 2001 Sep 1;21(17): 6706-17. 8. Berchtold NC, Kesslak JP, Cotman CW. Hippocampal brain-derived neurotrophic factor gene regulation by exercise and the medial septum. J Neurosci Res. 2002 Jun 1;68(5): 511-21. 9. Vigers AJ, Amin DS, Talley-Farnham T, Gorski JA, Xu B, Jones KR. Sustained expression of brain-derived neurotrophic factor is required for maintenance of dendritic spines and normal behavior. Neuroscience. 2012 Jun 14;212: 1-18. 10. Bekinschtein P, Cammarota M, Katche C, Slipczuk L, Rossato JI, Goldin A, Izquierdo I, Medina JH. BDNF is essential to promote persistence of long-term memory storage. Proc Natl Acad Sci USA. 2008 Feb 19;105(7): 2711-6. 11. Erickson KI, Voss MW, Prakash RS, Basak C, Szabo A, Chaddock L, Kim JS, Heo S, Alves H, White SM, Wojcicki TR, Mailey E, Vieira VJ, Martin SA, Pence BD, Woods JA, McAuley E, Kramer AF. Exercise training increases size of hippocampus and improves memory. Proc Natl Acad Sci USA. 2011 Feb 15;108(7): 3017-22. 12. van Praag H, Christie BR, Sejnowski TJ, Gage FH. Running enhances neurogenesis, learning, and long-term potentiation in mice. Proc Natl Acad Sci USA. 1999 Nov 9;96(23): 13427-31. 13. Pedersen BK, Febbraio MA. Muscles, exercise and obesity: skeletal muscle as a secretory organ. Nat Rev Endocrinol. 2012 Apr 3;8(8):457-65. 14. Gómez-Pinilla F, Ying Z, Roy RR, Molteni R, Edgerton VR. Voluntary exercise induces a BDNF-mediated mechanism that promotes neuroplasticity. J Neurophysiol. 2002 Nov;88(5):2187-95. 15. Acheson A, Conover JC, Fandl JP, DeChiara TM, Russell M, Thadani A, Squinto SP, Yancopoulos GD, Lindsay RM. A BDNF autocrine loop in adult sensory neurons prevents cell death. Nature. 1995 Mar 30;374(6521): 450-3. 16. Ozawa T, Yamada K, Ichitani Y. Hippocampal BDNF treatment facilitates consolidation of spatial memory in spontaneous place recognition in rats. Behav Brain Res. 2014 Apr 15;263: 210-6. Great wiki! You managed to provide very holistic coverage on all aspects of BDNF. I would just polish up a few typos, and you're good to go! This is really well done. I love the formatting of the site. It actually motivates me to want to exercise.